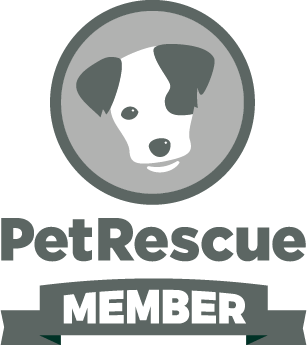 German Shepherd Rescue New South Wales is a volunteer rescue organisation based in New South Wales and provides homes for abandoned, surrendered and rescue dogs from animal shelters throughout NSW. Our rescue dogs are provided with all required veterinary work and are placed into foster homes to ensure they are rehabilitated and trained to be re-homed into appropriate and loving homes. All dogs listed are ready to go to their new home now. We are unable to hold a dog for you while you fix fences or go on holiday, etc. If you would like to make a contribution towards our rescue dogs you can do a direct bank deposit to German Shepherd Rescue New South Wales - NAB BSB 082 691 Account Number 135357074. We have an Adoptions Manager who screens all prospective candidates as to their suitability to adopt a German Shepherd Dog. We try to contact every one by phone but if that isn't successful we will email our application form to you, which needs to be completed and returned, or you can call us back and we can chat and complete for you. We will also ask you to provide photos of your yard and fencing to enable us to see where the dog will be kept and that they have areas of shade and shelter. All our dogs are ready to go to their new home, so when you enquire about a dog you must be in a position to take them into your home. We are unable to hold a dog while you fix your fences or go on holiday, etc. 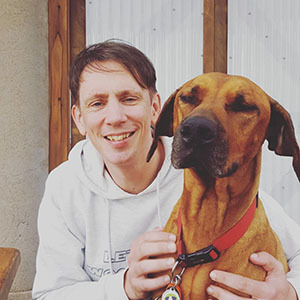 The successful candidate who adopts one of our dogs is provided with an information kit, ongoing support, training and advice on all aspects of feeding, training and general assistance to ensure both the new owner and our rescued dog settle into their home. 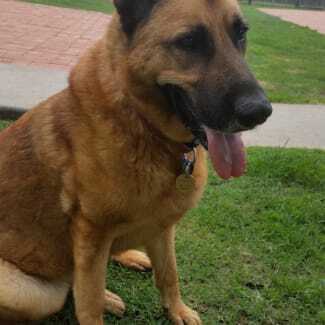 Mamba is a gentle and loving eight year old German Shepherd who is looking for a new home. Mamba is house trained, and a friendly boy who would be a wonderful companion dog for a couple or single person. Mamba is in need of a caring owner who will include him as a family member. Mamba was owned by a retired gentleman who had him as his companion. So if you are looking for a gentle shepherd who will enjoy a gentle walk and your company then Mamba is the dog. Mamba is ok with other dogs but not tested with cats or pocket pets. Due to his size we would recommend a home with older dog savvy children. If you think you can give this beautiful boy a new home, click on the orange button "Enquire about this Pet". 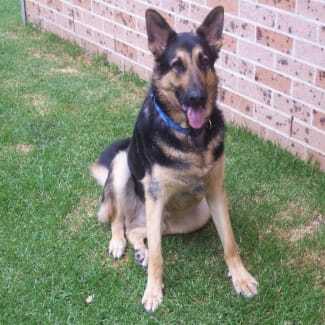 Cain is a desexed mature aged male German Shepherd who is in care at Kurri Kurri. Cain has come into our care after his former owner, who was an elderly lady and had owned Cain since he was a pup, unfortunately was unable to care for him as he became older and his mum was not able to walk him. Cain is a gentle natured shepherd who would benefit from further lead training. You see he has had minimal experience being walked on a lead, so now he thinks it’s a game and wants to play play tug of war with you but once he knows he must obey he will listen. Sadly Cain's former owner was no longer able to care for him and he was surrendered to the local pound. Since being with his carer and eight other dogs, he has not put a foot out of place, he loves playing with toys and having fun but is not boisterous or jumpy. Cain is the perfect gentleman, not suitable for a home with cats, totally house trained not a barker at all, so he is the perfect companion for a family with children over 10 years old, only because of his size, or with anyone who would like a lovely gentle boy who is used to being indoors with his family and just chilling out with his human pack! If you think you can give this beautiful boy a new home, click on the orange button "Enquire about this Pet". Benji is a beautiful older dog who was found wandering the streets and taken to a shelter, but his family never came for him, so he has come into our care. As he wasn't microchipped at the time we are only estimating his age at 6 years old. Benji is a very affectionate dog, who loves his cuddles. 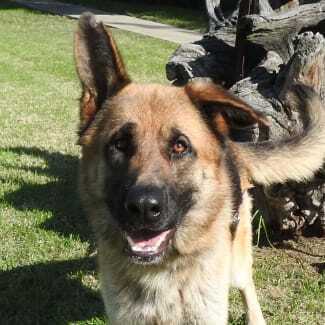 Benji is a big boned shepherd and so we recommend a home with older children due to his size. He has not been tested with cats or small dogs. Benji is good to walk on a lead we can see him being a wonderful companion dog for a Shepherd Lover. If you think you can give Benji a new home, please contact us by clicking on the link in the screen “Enquire for this pet”. 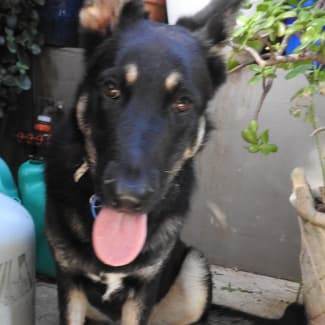 This young desexed female eight month old stock coated German Shepherd has come into our care after her former owner realised they could not provide this young dog with the necessary training and socialisation to ensure she grows into a calm and social dog. So little Venus is looking for a caring home where she will be provided with a stable home with a daily routine and further socialisation. This pretty and very intelligent Shepherd is fearful when introduced or in the company of other dogs of all sizes. So she will need a committed experienced Shepherd owner who will ensure she attends a structured dog training group so she gains confidence around dogs. Venus is such a loving dog with her humans and just wants to play and enjoy life. 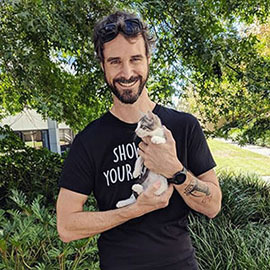 Yet untested with cats or pocket pets Venus is in foster care at Randwick. For more information on Venus please click the link “enquire for this pet”. 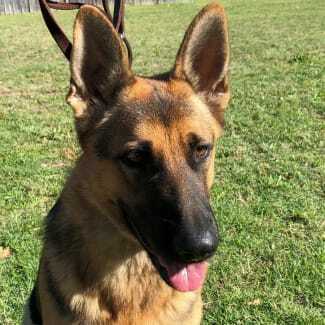 Bella is a beautiful two year old German Shepherd who is looking for a new home. She is currently living in Botany. Bella has had basic training, but being a young dog we are looking for a home that will continue her training and socialisation. Bella has not been tested with cats, small dogs or pocket pets. Due to her size and age we recommend a family with older dog savvy children. If you think you can give Bella a new home, please contact us by clicking on the link in the screen “Enquire about this pet”.